The PR-505T MaxiComfort Zero Gravity Lift Chair by Golden Technologies is one of the best selling lift chair recliners in the world. It incorporates all the features you want and has many wonderful options available. 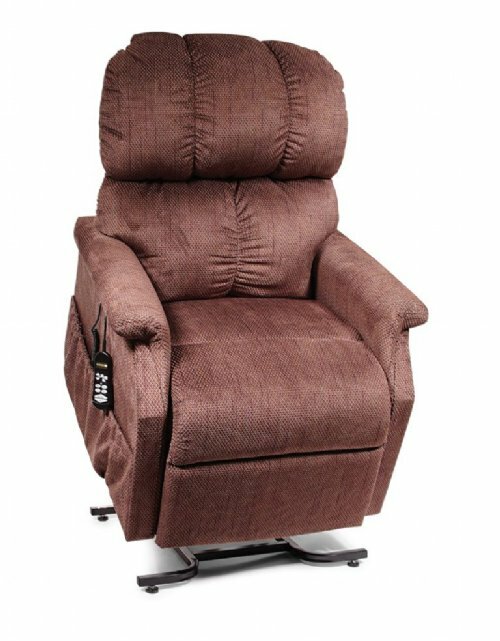 It comes standard with a chaise leg rest, independent back and leg motors for infinite positioning from having your feet 5" above your head laying out flat to help reduce swelling, through a zero gravity position to unload pressure from your lower back, to TV Watching position, to almost all the way standing up. The generous sizing makes it the tallest Zero Gravity Lift Chair on the market. MaxiComfort is available on four models of the Comforter 505 Series: the Small, Medium, Large and Tall. For more information on the Comforter with MaxiComfort Zero-Gravity Positioning Technology, please click on the links below. Floor to Top of Foot Rest Reclined 23.5"